Happy 4th of July to my fellow Americans. Here in New Hampshire it’s a dark and rainy day and we won’t be doing any grilling. 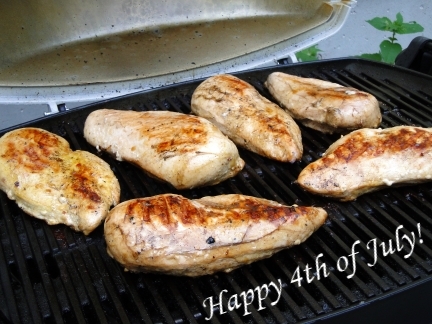 But a few days ago, before the heat wave hit, we grilled up some huge chicken breasts to use for our “no cooking” meals. It’s always difficult to find food to feed the family on muggy hot days. I could easily eat a salad, or have cheese and crackers (with wine of course), but my kids want more. So I headed to Roys’s Market in Peterborough where the chicken pieces were humongous and bought six pieces. I marinated them in my special, homemade marinade, and my older son grilled them for us. It’s been enough for the 4 of us to eat for 3 days. I’ve made chicken salad sandwiches, quesedillas, and enchiladas. Today we will finish up the enchiladas and maybe get some clams and seafood from Kimballs. Not cooking in the heat is top priority for me. We may drag out the ice cream maker and cook up some of that! So happy 4th to everyone, whether you are grilling, eating out or whatever. Be safe on this American holiday and enjoy the fireworks if it’s not raining where you are.